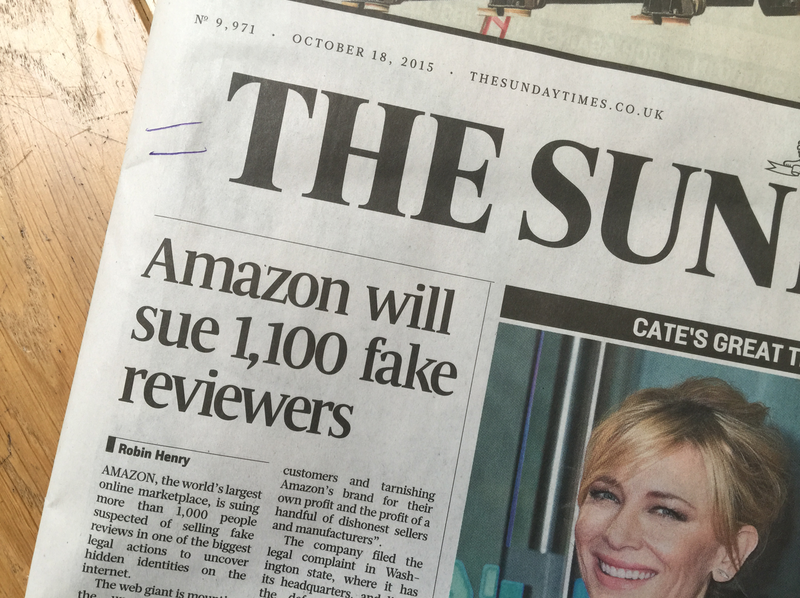 HelpHound Blog: Amazon fake reviews - just the tip of the iceberg? Amazon fake reviews - just the tip of the iceberg? 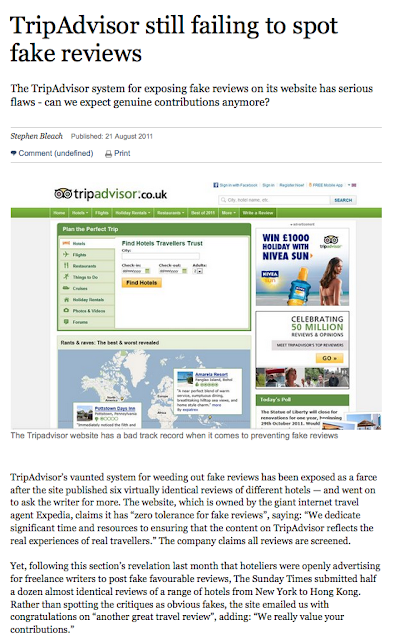 The Sunday Times returns to one of its (and our) favourite campaigns this week: against fake reviews (here is - for those of you who can negotiate their pay-wall - the full article and their famous 'fake hotel' expose of TripAdvisor) . And while we commend Amazon's stance against publishers and writers puffing their own work, we are not sure this is any better or worse than what happens in the mainstream (getting friendly authors to write reviews and/or flyleaf quotes); perhaps there needs to be a website 'outing' authors who are friends? But there is a very serious side to this, and it goes right to the heart of the world of reviews. And there's much more to it than just 'fake reviews'. Let's start at the beginning: why would anyone run a review website (or incorporate reviews into their website)? Selling advertising: this would be alright if good old-fashioned ads simply appeared as they do in print journalism; but what about when a company can pay to come top of search results for a particular service? Google make this pretty clear, but is every Yelp user aware that the first result in almost every search is paid for? Selling leads: How many consumers realise that the fact that they need a 'plumber' is being sold (as a lead) to the plumber(s) in question? 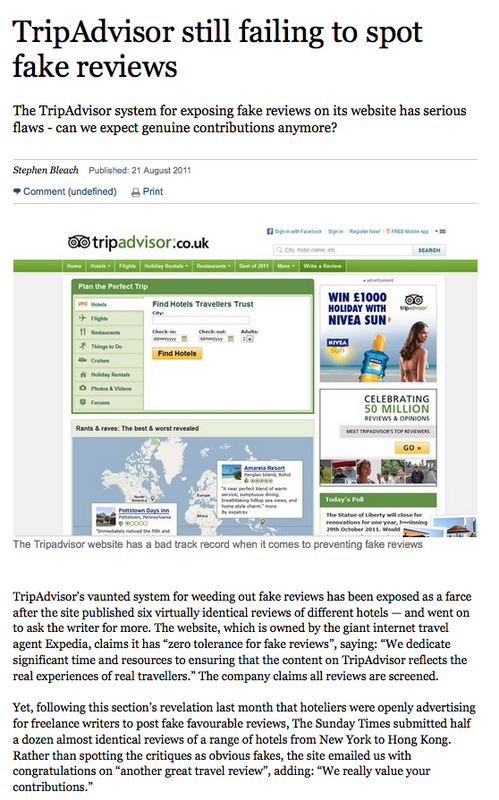 Commission: Again: how many guests realise that they are generating commission and fees for websites like TripAdvisor and Booking.com every time they book through them? It wouldn't be allowed if they were providing financial advice, but hotels are paying these sites anything up to 30% commission - straight out of the money consumers are paying for their rooms. Now: why would anyone want to write a fake review of their business? But is it (lower risk)? Yes, until Google and their peers decide (like Amazon) to crack down on fake reviews (and the companies who are the subject of those fake reviews). Anyone who doubts Google's ability to discover fake reviews (given the will) should bear in mind that Google knows every user's search history, keystroke by keystroke! What should we do if we suspect there are fake reviews about our business? You might be surprised to hear the justification that we hear: "But we are a great business, I only wrote the review because none of my customers had. "; "Why shouldn't I review my own business? I truly mean every word of what I wrote." and the list goes on. The dreaded TripAdvisor 'Red Flag'. How long before Google introduce something similar? None of these fall under the category of 'malicious fakes'; malicious fake reviews are posted as part of a concerted and intentional effort to deceive. Unsurprisingly, when you think about it, we don't often have face-to-face meetings with the businesses who are actively gaming the system (we once did meet with one who introduced us to an intern: 'This is [name], she writes our reviews on [X website]'. They instinctively know to steer clear of us. But we know who they are (and if we do, you can be sure Google do too). How do we identify fake reviews? It's part science, part art. In last night's Antiques Roadshow a woman presented Rupert Mass with a painting she reckoned was a genuine Turner. He tried, as tactfully as he could, to disabuse her, first by explaining that he had been looking at the real thing for over forty years and he 'knew' it was not a Turner, then, when she persisted, he referred her to the framer's date stamp (1872); Turner died in 1851 and stopped painting Venice over fifteen years earlier. An estate agent has great Google reviews. Our moderators are asked to have a look at them. Out of the first ten they are able to positively identify that six were written by connections of the business. How? By cross-referencing the business's own website (estate agencies invariably include staff biographies on their websites) with G+, Linkedin and Facebook (and not always the 'suspect's' own Facebook or Linkedin page). In one case a review had been written by a colleague who had used the same photograph for his G+ account as his Linkedin entry, in another Linkedin identified that the reviewer was a recent ex-employee of the company under review. The other four were similar, the balance failed the 'nose' test ('fake' reviews often follow a distinctive pattern, avoiding the use of the first person 'I, we' for instance). First and foremost: remember that your reputation is your most valuable business asset: it is highly unlikely that you built that reputation overnight in the real world, so be patient in the online world. Get a review a week to your own website and a review a month to Google and in two years you will look great on both. Resist the temptation to cut corners and game the system: we have an ever growing list of businesses where we have concrete evidence that they are 'up to no good' and Google cannot be far behind us! What do we mean by 'up to no good'? Examples include: employees of different branches of the same business writing reviews of their sister branch; management openly encouraging staff to write bogus reviews from their home computers; staff being asked to encourage friends and family to write bogus reviews, and the list goes on. One day Google will catch these businesses, and when they do the consequences will be dire (just ask any hotel that has been 'red flagged' on TripAdvisor - mind you, you will be hard-pressed to find one: they've mostly had to close). Do everything possible to redress the positive/negative imbalance: by this, we mean the disconnect between theory and reality: in an ideal (?) world everyone would write reviews, positive or negative, whenever they used a business; in practice a negative experience provides hugely more motivation for the average consumer to write a review. This skews results against (especially SME) businesses. We often meet businesses with thousands of customers whose only reviews on Google are a solitary 1*. TripAdvisor has gone a long way towards resolving this issue by actively encouraging hotels to invite their guests to post reviews; Google should do the same. Insist on proper authentication: make it as near as impossible as you can for anyone to write a review using anything but their true identity. We have examples of malicious reviewers setting up multiple G+ accounts to harm businesses. You have the power, just use it. Weed out anonymous reviews: up until recently people could post as 'A Google User'. It was a hangover from the old Google Places. Delete them all (maybe give the reviewer the option to add their identity before you do!). Understand the difference between businesses that incentivise reviewers to write reviews and businesses that incentivise reviewers to write positive reviews: you should view the former as laudable and helpful to Google users, the latter should quite rightly continue to contravene your T&C's. Unless you do this SMEs (which lack the volume of customers) will always struggle against the big corporates. And it's the SMEs your users need to know most about (after all, who needs to read yet another review of McDonald's or Sainsbury's? We see this occasionally, never - yet - from a client of ours, but about once a month a competitor (we assume) tries to sneak a negative review through Resolution, without success. We make it clear to all our clients that we have a 'two strikes' rule - first strike: warning, second strike: out. We couldn't be more aware that the one thing that sets our reviews apart from mere testimonials and most other kinds of review is the fact that they can be relied upon by your potential customers; not just ' a bit', not just 'most of the time' but all the time, one hundred per cent. There's no shortcut. If you want great reviews on your own website and anywhere else that influences your potential customers (Google for most, still TripAdvisor for many in hospitality) you have to get a system like Dialogue™ on board (you can't verify your own reviews!) and then work hard at getting your clients to write reviews. It's not impossible - see this success story. Robo-advice: first financial advice, where next?